Sharp’s reputation in the HDTV stakes just got bigger with its announcement of its latest TV behemoth, the LB-1085. 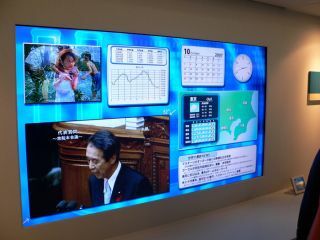 At 108in it’s the biggest LCD TV on the market, with its specs weighing in at 2,572 × 202 × 1,550mm. That’s means it’s over five foot tall! The panel is Full HD (at this size, it needs to be) with a 400 cd/m2 brightness, 1,200:1 contrast, 6ms response, and a 176-degree viewing angle. Even though it’s the size of a house, Sharp could only fit three HDMI ports at the back but you do get two component, two composite and S video connections. For those who have ecological concerns, look away now as this is one power hungry telly, sapping 1130w. So, every time you want to watch the footie, you better warn the National Grid. And the whole thing weighs in at a back-breaking 195kg. Price-wise: other than shipping the thing from Japan, it looks likely to retail at ¥11 million. That’s £50,000 to you and I.